Pan Seared Salmon Recipe – A delicious 10 minute recipe that will truly have you wanting more. It’s crispy on the outside yet moist and tender on the inside. Once you’ve mastered the art of searing, this simple yet flavorful dish will become a dinner staple in your home. 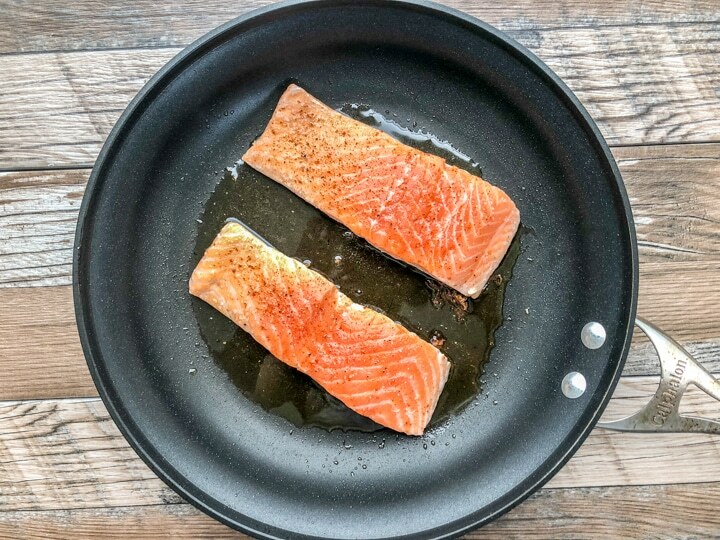 With springtime in full swing, I thought it would be appropriate to share this simple crispy Pan Seared Salmon Recipe. This is the perfect recipe that you can whip up quickly when you’ve come home after enjoying the outdoors with friends and family or after a long day of work. Although this recipe requires minimal ingredients, you can add your personal touch by adding your favorite ingredients or spices. 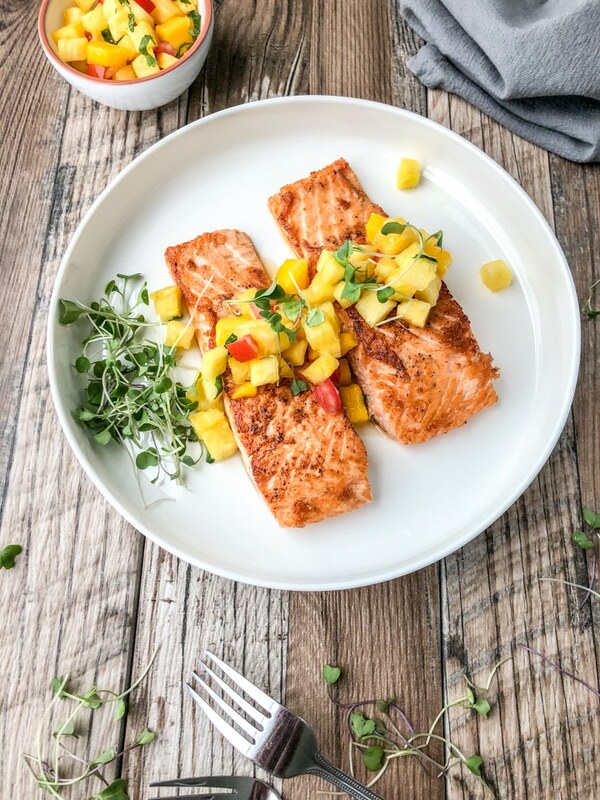 Salmon is one of those proteins that pairs beautifully with a variety of veggies, sauces or unique salsas as in this Pan Seared Salmon with Pineapple Mango Salsa as pictured below. Tip 1: Always use a clean paper towel and lightly pat dry your protein even after marinating – This will allow the paper towel to absorb as much liquid from the protein as possible. Tip 2: Add oil and or butter to a pan or skillet and place over medium-high heat. The pan doesn’t have to be smoking hot but it should be hot enough to create a beautiful caramelized outer crust on the salmon. Tip 3: Depending on the size of the pan, do not place more than 2 salmon fillets in the pan at once. This will ensure that you get the best possible sear. In other words, do not over-crowd the pan. It’s best to cook this crusty Pan Seared Salmon Recipe in batches. Tip 4: Resist the urge to move or flip the salmon fillets too early. This defeats the purpose of searing. Try your best to be patient. Walk away from the pan if necessary (keeping safety in mind of course). For this recipe, I didn’t touch or flip the fillets for 5 minutes from the time I added them to the pan. By following these tips, you’re well on your way to cooking this Pan Seared Salmon Recipe perfectly. If you’re looking for a healthy springtime dish that’s ready in under 15 minutes, continue reading. Seasoning: For this Pan Seared Salmon Recipe, I used kosher salt, black pepper and smoked paprika. In my opinion, salmon doesn’t need a lot of salt. You do not want to mask the delicate taste of your salmon with a ton of salt. Searing: This step is important as searing really enhances the flavor of salmon. When starting this process, keep the tips mentioned above in mind in order to get the best results and remember to avoid the temptation of flipping the salmon over too early. Bake in oven: The final step to this super simple and delicious recipe is to bake the salmon in the oven at 400 degrees for an additional 4 to 5 minutes. It’s crucial that you do not overcook the salmon as it will cause dryness. I recommend that you set the timer on your oven or smart phone. 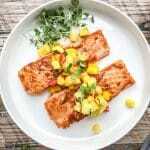 Topping: Top this Pan Seared Salmon Recipe with pineapple mango salsa for a gourmet style dish. This adds a wonderful unique and refreshing taste that’s quite addicting. As you can see, there are so many bonuses to making this dish. It’s quick, easy, versatile, and allows for easy cleanup. By the way, if you have questions about ‘How To’ recipes or need tips, please send me an email to: cree@cookingwithbliss.com. By the way, this Pan Seared Salmon Recipe is Whole30 compliant. 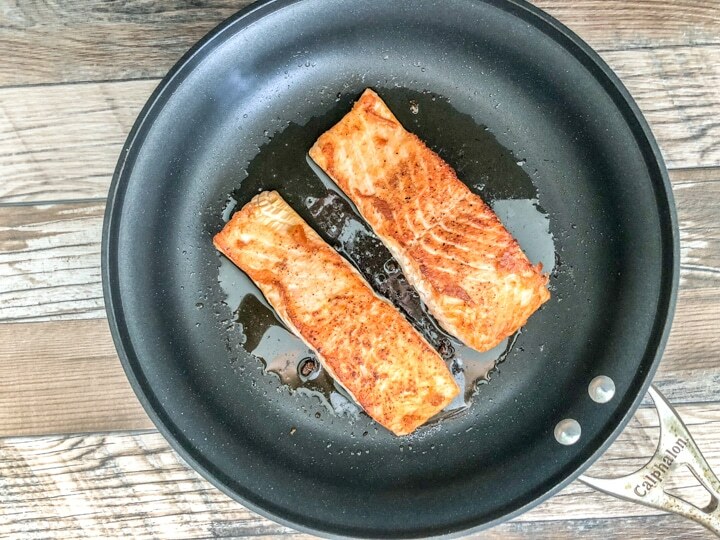 Pan Seared Salmon Recipe - The perfect quick and easy dinner that can be turned into a casual weeknight dinner or an elegant weekend dinner for two. Just think a beautiful dish that ready in under 15 minutes. 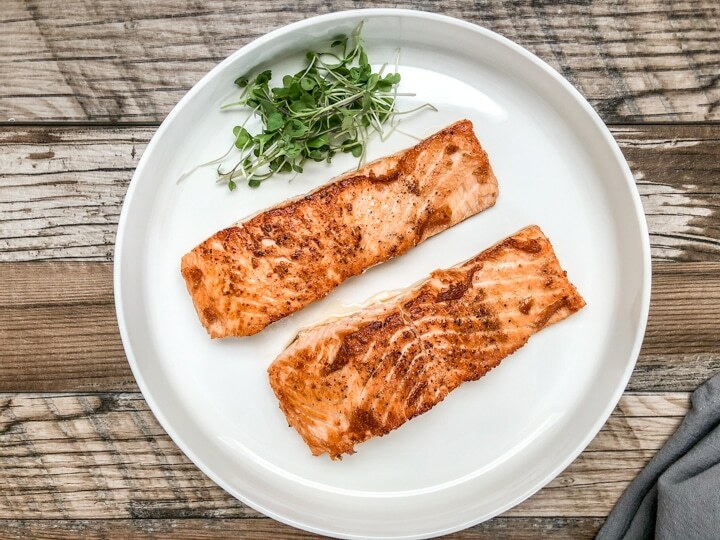 Although it's made with minimal ingredients, this salmon recipe offers a burst of flavor that will have you wanting more. 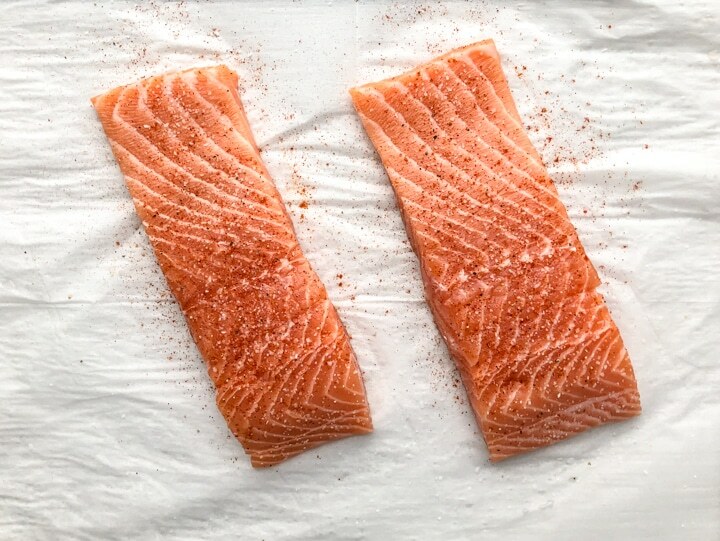 Wash salmon fillets and pat dry with clean paper towels. Season each fillet with kosher salt and smoked paprika. Set aside. In an oven-proof pan or skillet, drizzle in olive oil over medium heat. Once pan is hot, add salmon fillets. Do not add more than 2 fillets at a time depending on the size of your pan. This will allow for a perfect sear. At the 5 minute make, using a spatula gently lift a little portion of the edge of the fillet and peak underneath to ensure that you have a beautiful sear on the underside of the fillet. If so, gently flip the fillets over. Place in preheated oven for an addition 3 to 5 minutes. Remove the salmon fillets from the pan and plate. Serve alone or if you like, top with pineapple mango salsa or other herbs for a fresh bite or enjoy with your favorite side dishes.